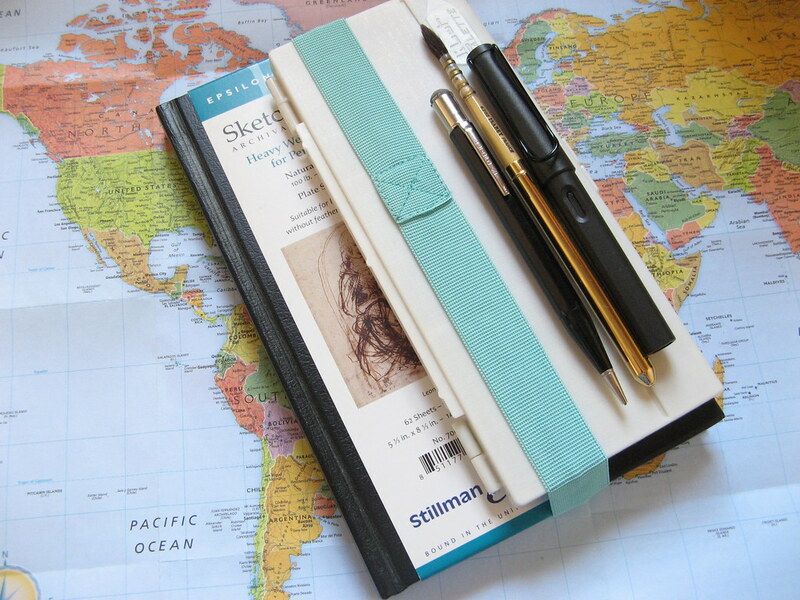 Paperblanks blog: Writing Wednesday: Improve Your Writing… with Science! That is a watercolor palette under the strap along with an Autopoint mechanical pencil, travel brush, Lamy Safari with Noodler’s Lexington Gray, and a Stillman & Birn Epsilon Sketchbook. Ready, set, go! 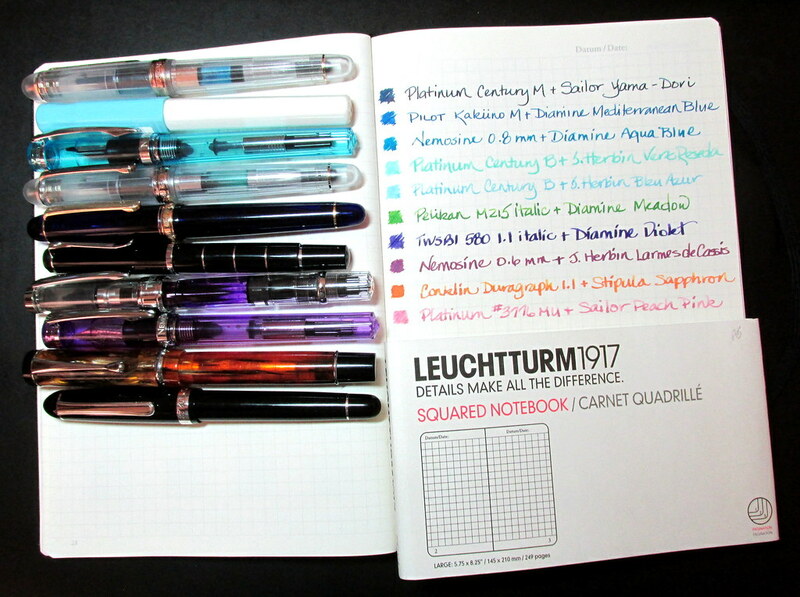 The Leuchtturm1917 paper is so nice to write on that finding compatible inks and pens has become a quest. Every duo on hand whether for personal use or testing purposes gets a page to itself in the search for suitable matches. With a few exceptions, wide and flex nibs have caused dots of bleed through. There is some show through, but it isn’t a deterrent for me. At least in my journal, neither is the tiny degree of Moleskine-like feathering. How the pen moves across the paper is more important for private musings and the sheer joy of writing. The paper is absorbent so free-flowing inks produced the most bleed through. After testing more than twenty, this is now a predictable characteristic eliminating some inks from use in the Leuchtturm. No hardship since other inks work just fine. However, the tendency to feather along a few of the fibers will be off-putting to some users. A Pentel Pocket Brush Pen with J. Herbin Lie de The or Noodler’s Kiowa Pecan showed no feathering or bleed through. Good mates for this journal are to be found. What continues to surprise is the way in which the paper handles light watercolor washes. There is very little buckling though with some colors I had to work at getting enough paint down. The paper held up well considering the abuse. No bleed through, but watercolor is more dense than ink. With more coarsely grained pigment particles and less water than ink, paint dries on the surface. It isn’t as translucent as ink, but for a hit of color or some doodles in margins, watercolor will do the trick. This might seem like heresy, but the Leuchtturm1917 journal provides a wonderfully soft surface for my Autopoint mechanical pencil with HB lead. Should the need arise, a FACTIS extra soft eraser will leave the paper’s surface intact. It can even be used gently on art paper. The deal here is that I love the paper and needed to persist to find good mates for it. Hey, persistence is a positive trait, isn’t it? 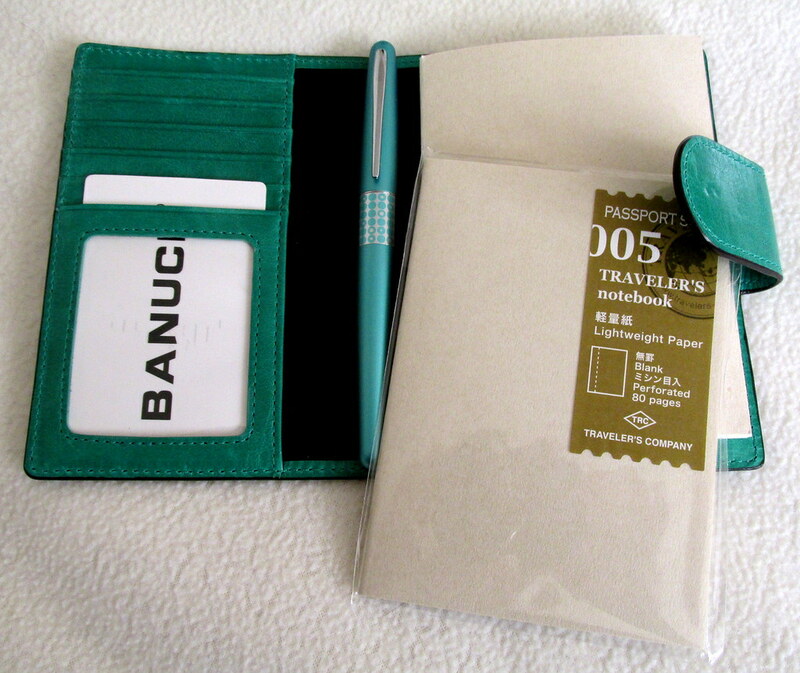 to form a compact kit for writing and doodling any time space is limited or travel is necessary. 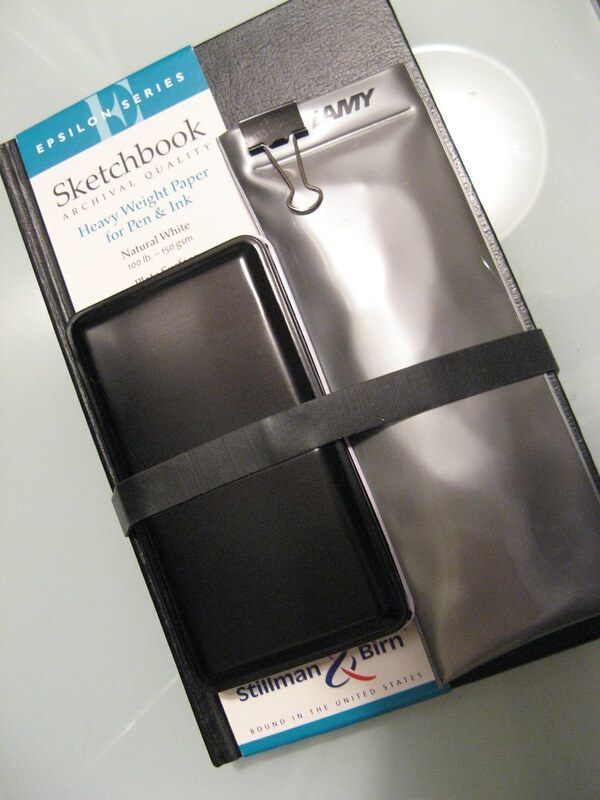 The notebook band holds everything securely so I can grab the kit on the go. It also keeps the journal closed so the pages do not get damaged and bits I’ve tucked between pages stay put. However, if I want to play things extra safe, a clear, plastic zipper bag that formerly held a pair of new pillowcases, is the perfect size for the whole caboodle. Another option is to place the waterbrush in a zip lock bag so that even under pressure, no water leaks where it isn’t welcome. 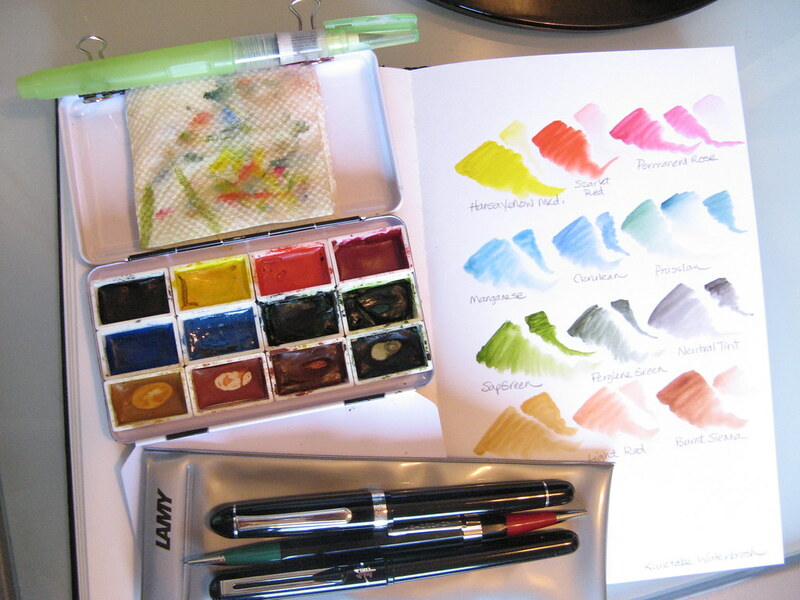 The beauty of this kit is that it holds enough tools for a variety of activities from writing to drawing to painting and all sorts of doodles in between. I do like to be prepared. Do you carry a kit and, if so, what goes in it? It’s that time of year when pink wriggles its way into my rotation. With excellent timing, Karen at Exaclair sent a bottle of J. Herbin Rose Cyclamen while Elaine at Jet Pens offered a Kyokuto notebook and the two became fast mates. Not Karen and Elaine. 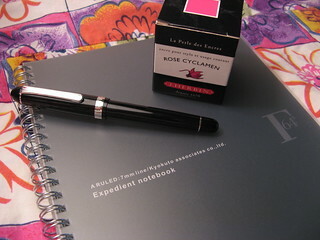 The ink and notebook. The images tell the story well enough, but a few points bear mentioning. Rose Cyclamen is a strong pink. Nothing pale or wimpy about it. It is on the cool side with a blue bias that stands out on while paper, but softens a bit on cream colored paper. It has good coverage, but no shading from the Platinum #3776 music nib. 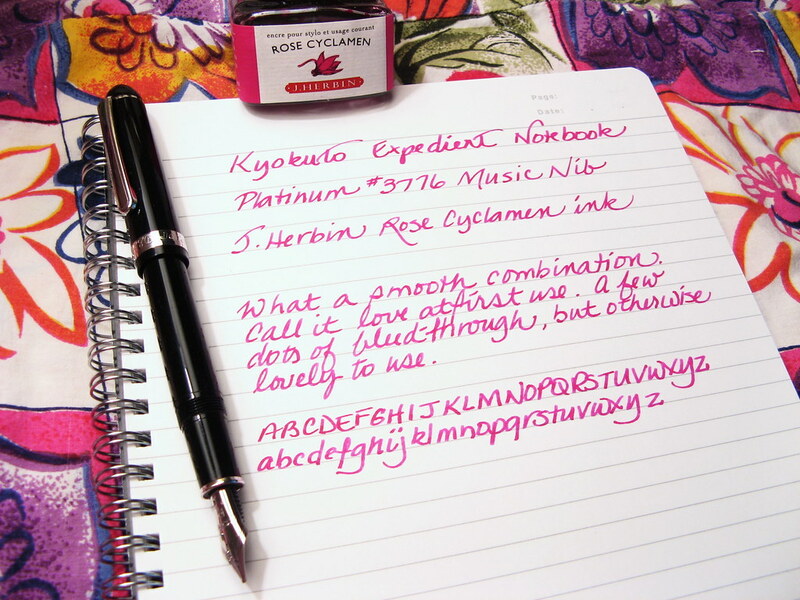 Even from a fine nib, it should provide strong color. Especially during the summer, I prefer it to red for editing or margin notes. But if you’re going to use Rose Cyclamen for correspondence, it should be to a really close friend, really close, or your intentions might be misunderstood. 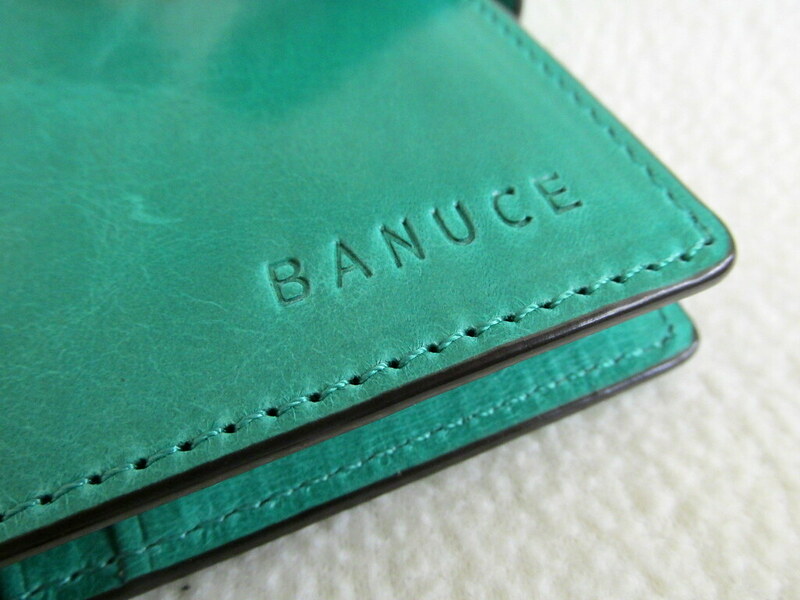 The color was difficult to photograph. On my monitor it is a bit too bright. The color on the bottle is more accurate so go by that. 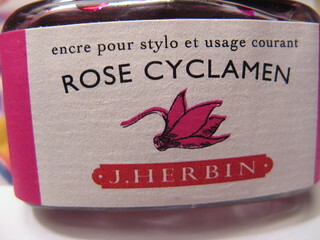 J. Herbin makes some very pretty inks and Rose Cyclamen is a memorable one in its lineup. If you like pink, this one should make you happy and be a good mate for any pen. Just ask my Platinum #3776. It keeps asking for more. Really! The B5 Kyokuto Expedient Notebook is available in three colors, black, silver and white in ruled, dot grid and plain styles. 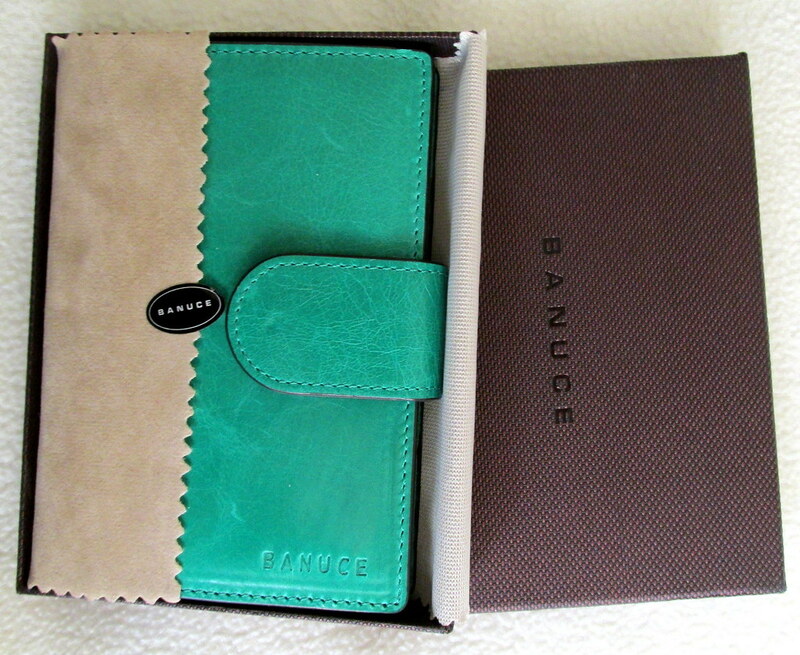 The form is excellent with a plastic cover, stiff cardboard back, double ring binding, and rounded corners. 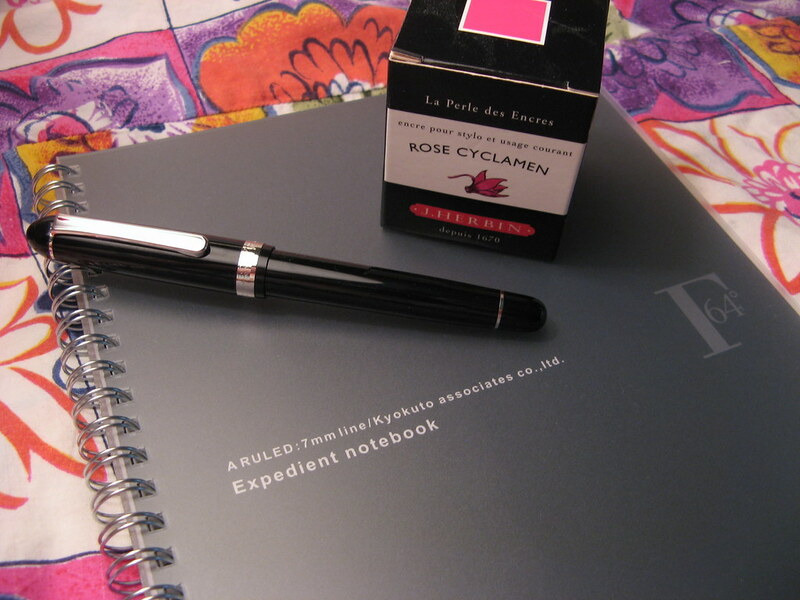 White paper and gray lines make the ruled Expedient a neutral fit for any ink color. 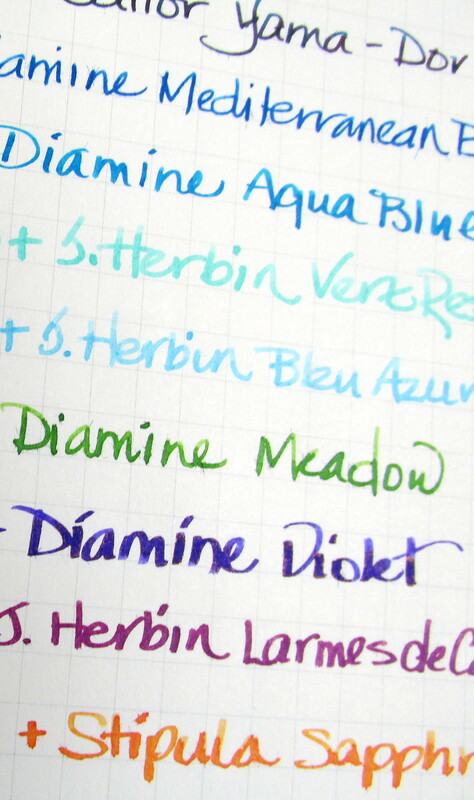 There was a little feathering from some inks, but I’ve seen Diamine Emerald and Teal misbehave elsewhere. The paper is very smooth and the 7mm line spacing excellent with my stubs and italics without any scaling back on my letter forms. 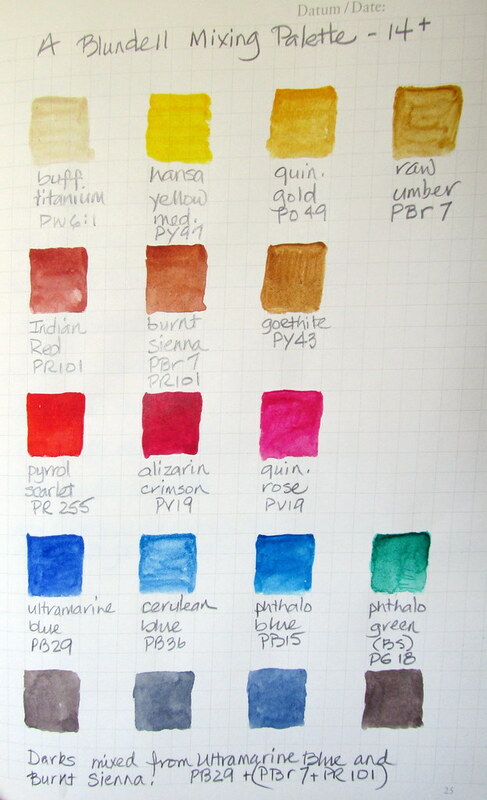 However, there is a caveat with fountain pen ink. Most produced considerable bleed and show-through though my trusty Sharpie Pen suffered no such indignities. 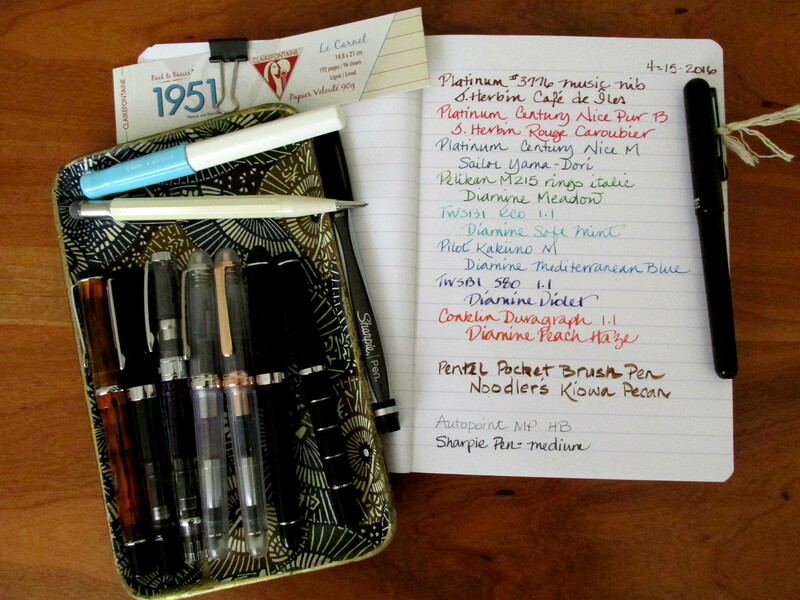 I have no explanation for the lack of such problems with Noodler’s Black and Zhivago. The pen used with the latter has a rather dry nib, but the one used with Black has an average flow. 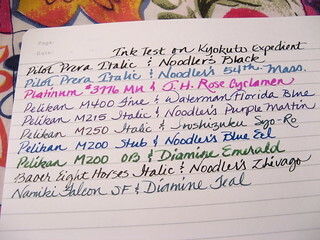 Rose Cyclamen and Waterman Florida Blue performed the best of the remaining inks. Gel pens and ball points should present no issues. Narrow felt tips will work, but pens that lay down a lot of ink are iffy. The white paper and gray lines are perfectly suited to pencil especially wide soft lead for which I admit a weakness. On Expedient paper, my Autopoint mechanical pencil with 0.9mm HB lead glided effortlessly and produced a satisfying line. I absolutely love paper that works with all inks, but this isn’t one of them. If you don’t mind a few uneven outlines here and there, and you only use one side of the paper, the Expedient could work well for you. Some of the inks I use the most showed no issues, so it will fit in my rotation especially for pencil notes and that’s something that happens every day. Thanks, Karen and Elaine, for the opportunity to test your products. Your generosity is much appreciated. My desk is always a disheveled mess except for my fountain pens. Those I keep tidy and at the ready for whenever the muse strikes. However, with product testing, the number of inked pens can grow well beyond anything manageable, so I’m separating the lot into two groups with my Core Four Plus One the most accessible. Others employed mostly for testing purposes have a tray in which to snooze until needed. 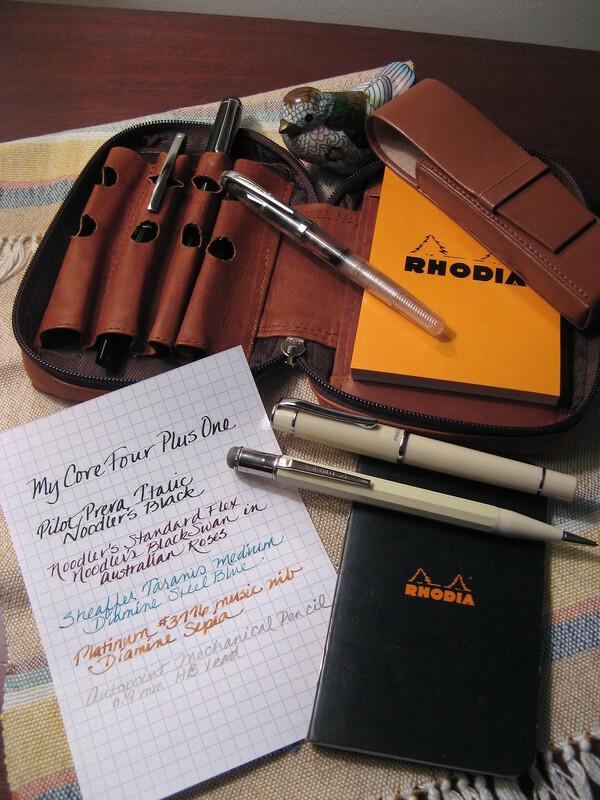 Core Four Plus One is a name for four of my most used fountain pens plus one mechanical pencil. The four pens are the mostly likely to get used either for the ink or the fun factor of using that particular pen. The Platinum #3776 music nib is the anchor. 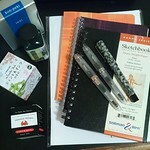 For now the other three pens are the Noodler’s Standard Flex, the Pilot Prera Italic and the Sheaffer Taranis Medium. Those four provide a good variety of nibs and pen sizes and changing between them is good for my hand. The inks are Diamine Sepia, Noodler’s Black Swan in Australian Roses, Noodler’s Black and Diamine Steel Blue. Again this is a good variety for maximum appeal though all of it is subject to change on a whim. The Autopoint mechanical pencil is the Plus One. It gets more use than any fountain pen since it doesn’t need to be uncapped, can write on any paper, and is erasable, an important benefit for a fickle writer. 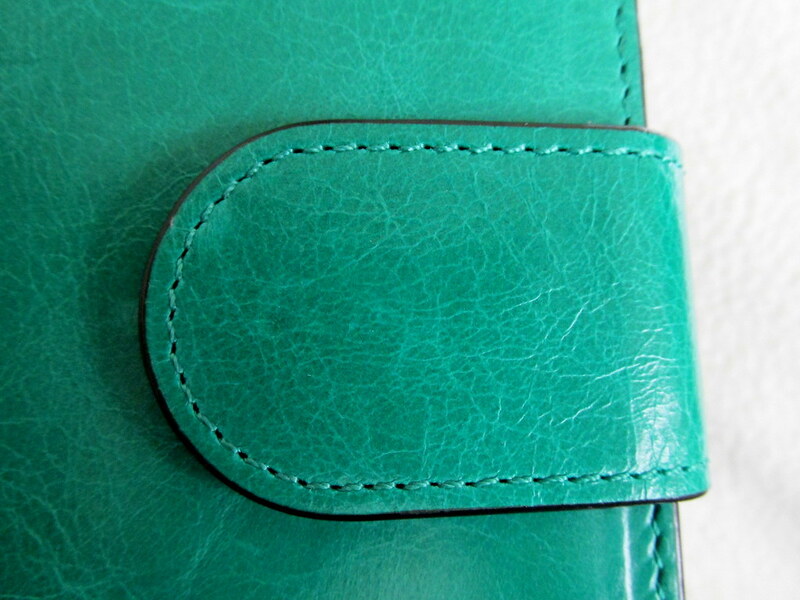 When I head out with pens in tow, I have a two-pen case for an intrepid duo or a four-pen case for the whole lot. An Autopoint MP is always in my handbag along with a black Sharpie Pen so I am never caught out without writing tools. 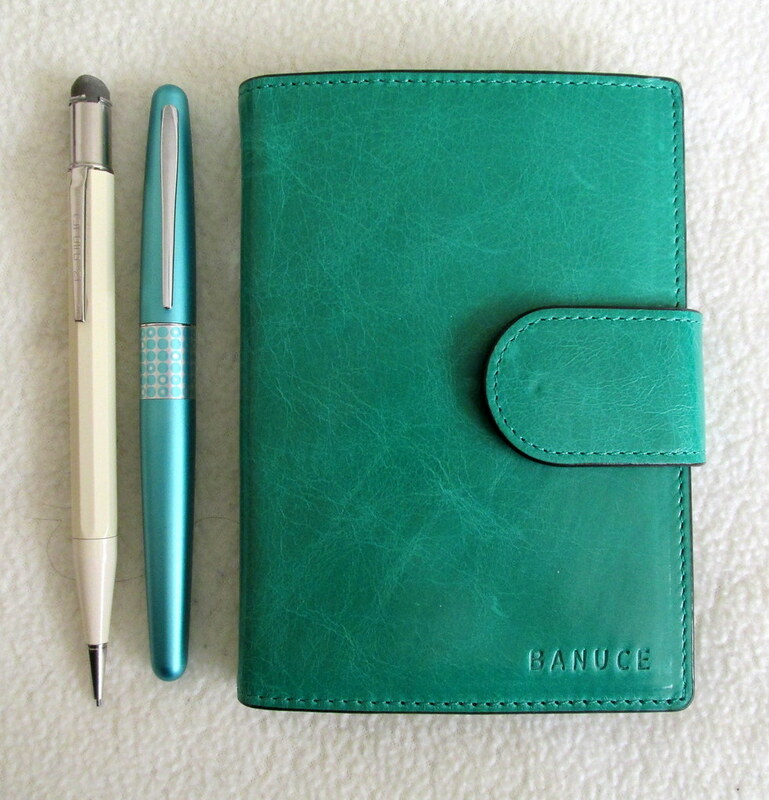 A small Rhodia pad completes the ensemble. An inkophile should be prepared, yes? Do you have something like my Core Four Plus One? If so, what’s in your primary rotation?